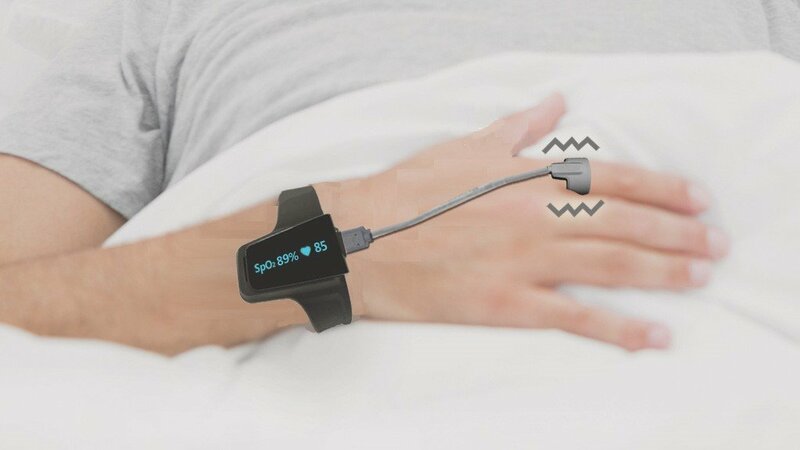 Intuitive wearable with sleep and physiologic monitoring capabilities. Straight forward app with seamless setup. Extremely valuable product for those dealing with oxygen saturation issue or lung disorders. 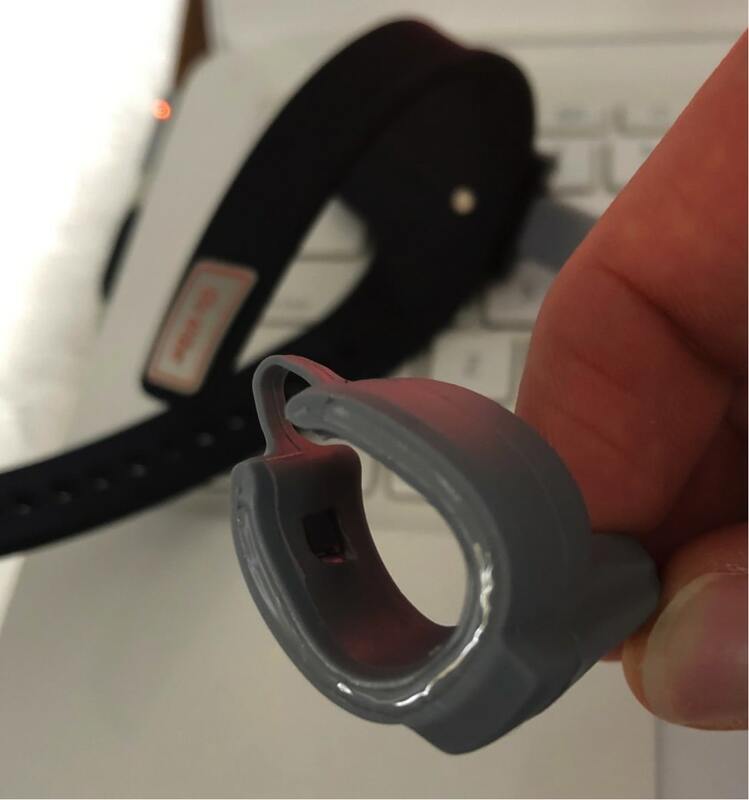 The band itself is a sleek design, built from durable rubber with a plastic interface and somewhat seamless design. Very light and fits well on the wrist. The interlocking metal latch certainly made sizing painless and it’s very sturdy from a longevity standpoint. The app which accompanied the product was rather intuitive and provided an easy setup with in-app and written directions. Certainly, not much to say about the tech side as this was a pretty easy and user friendly experience. When it comes to data monitoring, I’ll be the first to tell you that analysis is the toughest part. Having the ability to constantly monitor your health is priceless, but understanding what to do with the numbers on the screen is a whole different ball game. Telemedicine is the future of the healthcare profession as doctors don’t have the time, energy, or resources to adequately respond to all the challenges from patients dealing with chronic illnesses. As such, the O2 vibe has the potential to provide patients with a more individualized sense of medicine. Patient reports are stored on a daily basis and can be sent to physicians for feedback and monitoring. This becomes especially interesting when we venture into the realm of sleep tracking. Given most individuals struggle with sleep at some point in their life, it can be helpful to understand what’s going on at different points throughout the night. Here’s what a sample reading from the O2 vibe looks like. 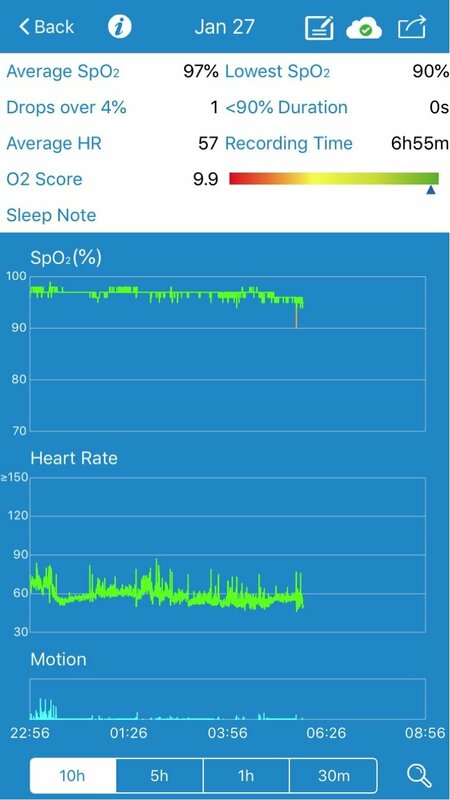 Motion, heart rate, O2 saturation, and general “O2 score” to provide you with an indication of what occurred throughout the night. As you can see, there were a few alterations throughout the night but for most part, not much going on. However, I am young (27) and mostly healthy so the lack of alterations was somewhat expected. For starters, let me say this – the O2 vibe is not in the same product class as a Fitbit or Oura ring. As such, it’s not designed to focus on sleep stages or the quality of one’s sleep by tracking specific time periods spent in certain phases of slumber. On the contrary, the device is actually exceptionally beneficial for those struggling with cardiopulmonary issues (COPD, sleep apnea, asthma, etc). As such, this class of wearable is in a category all by itself – if you wanted to compare it to others in the market, you might look at Beddr, Go2Sleep, or EverSleep. Why even mention them? Well, it’s important for folks to understand the specific population that this wearable might influence. If you’re young and healthy without any cardiovascular issues, it might not be the best choice (right not). 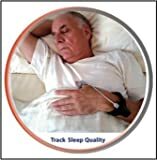 However, if you’re dealing with sleep apnea and disordered breathing patterns, this could be of exceptional value. 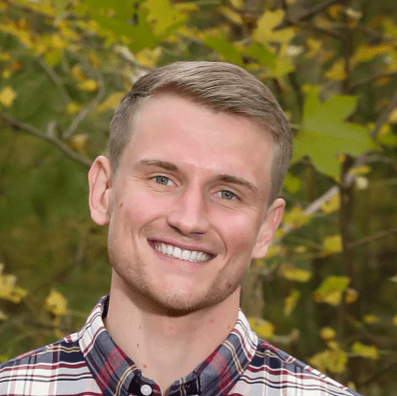 Having worked with countless individuals who wanted to track their sleep, improve their performance, and find a healthier lifestyle, I’ll be the first to tell you that most folks don’t understand what to do with the data they’re collecting. That’s no fault of their own though, we aren’t exposed to any formal sleep education in academic settings and most layman information is somewhat generic (i.e. “go to bed early and get 7-9 hours”). So, suffice it to say, if you’re not familiar with sleep tracking or human physiology and you’re not working with a physician who could interrupt this data, it may be slightly confusing and somewhat frustrating. However, don’t let this discourage you! If anything, this should be the impetus to assemble a team of individuals who can help you get your sleep sorted as you seek to improve your health. Bodimetrics might be the extra piece of the puzzle which provides you with the data you need from the comfort of your own home. Please understand, Bodimetrics as a company is specifically designed around the idea of telemedicine and virtual connectivity. As such, this product is likely most beneficial to the user when coupled with an expert who understands sleep related cardiopulmonary issues. The O2 vibe boasts some fitness monitoring capabilities during “light” exercise but doesn’t specify any parameters. I decided to test it alongside a pulse oximeter and see if it was able to keep up with some mild to moderate cardiovascular and strength work. During a weight lifting session, I decided to track steps as well as heart rate to monitor intra-session recovery (set to set and between each exercise). However, I found that the accelerometer drastically overestimated step counts as it was too sensitive to even the smallest perturbations. For example, while driving home, I went over a speed bump and my step count increased by 4. When I finally arrived home, I checked my step count after the 75-minute workout and was astounded to see that the device claimed I had incurred 3000+ steps. So, in the span of 75 minutes I traversed almost 1.2 miles while lifting free weights and using the occasional machine? I don’t want to cast double on the data but if you’ve ever been to a gym, most people aren’t running sprints in between sets. They’re usually seated, scrolling through social media, or changing their song on Spotify. Needless to say, I would be careful about basing any caloric expenditure calculations off the accelerometry metrics as they may be incorrect due to overestimation. Heart rate was a slight different story as it seemed to be slightly more accurate. When compared to a pulse oximeter, the HR and O2 saturation data was exactly the same. However, the O2 vibe was actually a bit faster in responding to changes in physiology at rest – but, it couldn’t keep up when moderate activity was added to the equation. In my experience walking was handled easily but weight lifting or any sort of moderate to strenuous cardiovascular work was too much for the platform to handle from a monitoring perspective. Disclaimer: Bodimetrics does mention within their user guide that the O2 vibe is probably only suitable for “light activity” – as such, my personal experiment shouldn’t be a determining factor in the applicability of the product or platform. The device comes with a standard battery life of 10 hours. While this may not matter for some, I’m thinking that most folks likely don’t want to be bothered with charging their activity monitor twice daily. 10 hours of battery life is enough to get you through a night of sleep or a stressful workday and subsequent workout. But, amid a rather hectic and fast paced lifestyle, most probably won’t remember to charge their band twice each day. As such, this could be a limitation for those who live a nonstop lifestyle and are looking for a monitoring tool with an extensive battery life and monitoring capabilities. 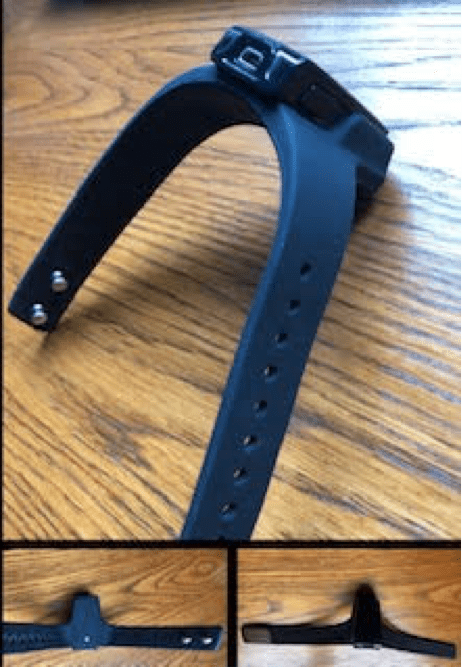 I’m 6’4” and have rather large hands compared to most men so I found the strap to be somewhat restrictive and found myself waking up multiple times each night with a thumb or index finger which had fallen asleep. Swapping fingers didn’t seem to remedy the issue, so this could be a concern for those with large hands, given it’s somewhat uncomfortable to lose circulation in a finger while asleep. The current millennial generation seems to be data obsessed as we’re seeing the global rise of Fitbits, Apple watches, and other fitness trackers designed to push you into a heightened state of health consciousness. However, this device and its modus operandi are primarily for those struggling with respiratory or cardiopulmonary issues (perfusion, oxygen delivery, cardiac abnormalities, COPD, etc). 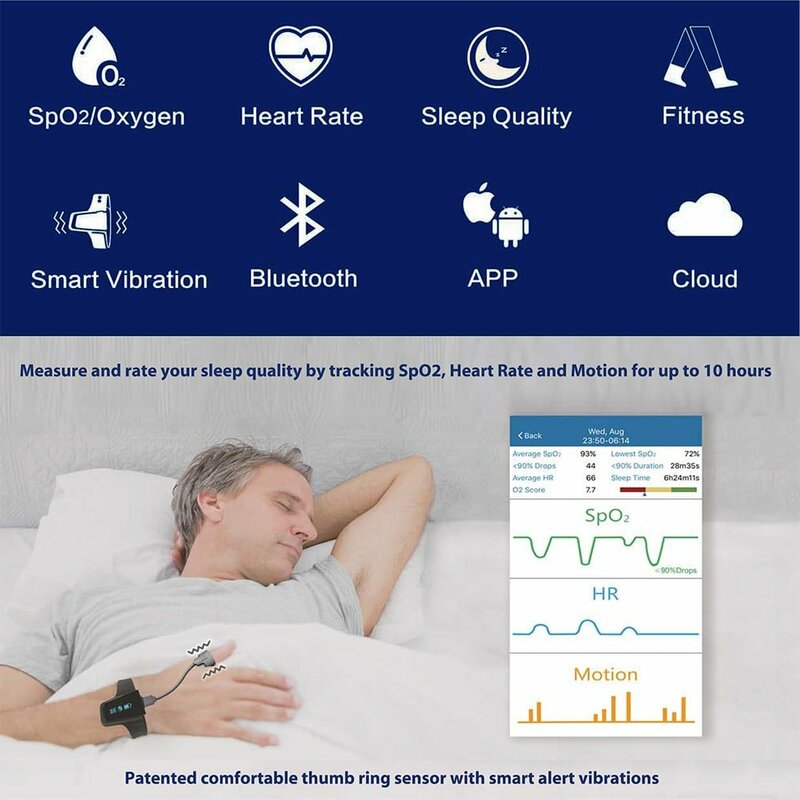 Similarly, if you or a loved one is struggling with sleep apnea, this could be massively beneficial to track disruptions throughout the night. So, this tracking software definitely serves a purpose but more so for a very specific niche population. When paired with the other monitoring technology offered by Bodimetrics (i.e. the performance monitor), it could provide some rather important insights into one’s health. Especially given both monitors have cloud capabilities which allows physicians to access virtual content 24/7. Not to mention, Bodimetrics boasts an exceptionally well versed and diverse medical advisory board who could play an integral role in advising your healthcare provider on the subject or advance your health through personal sleep improvements. Regardless what you’re looking, the capability for monitoring and trend analysis must be present prior to the impulse for action and that is exactly what Bodimetrics is striving to offer.